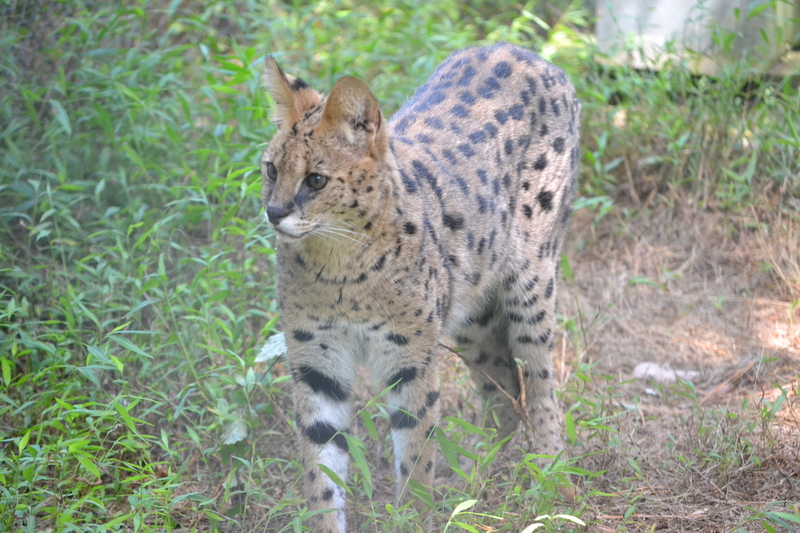 Daxon Serval was rescued from a private owner in June of 2017. 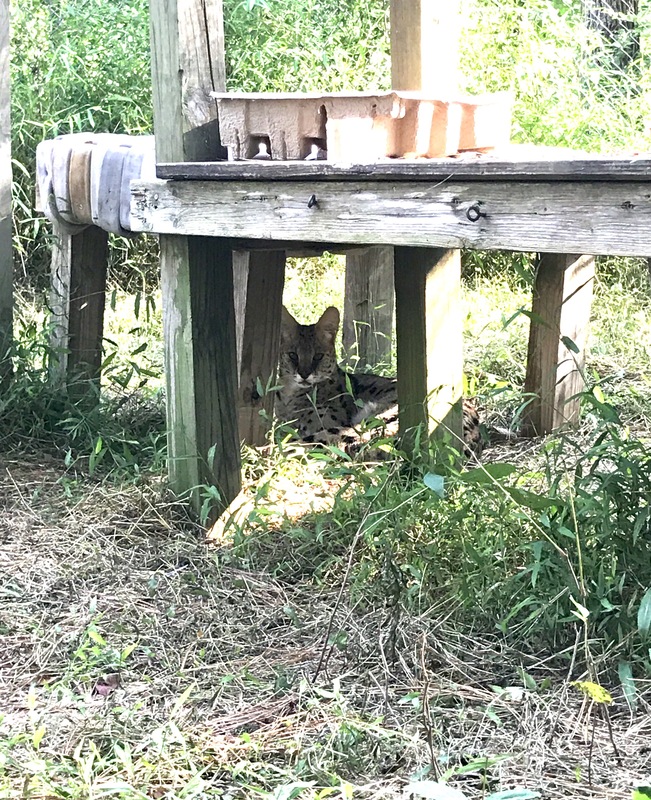 He was owned in a state where it is illegal to own wild cats and the owner reached out to Carolina Tiger Rescue in hopes we could provide Daxon with a lifelong home more suitable to his wild cat needs. Daxon is a bit shy at first and a bit weary of new people, but, since moving to his outdoor enclosure, he has really started to come out of his shell. Daxon enjoys when visitors sit down a safe distance from his enclosure and just talk with him and provide him with their company. 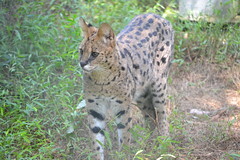 He is a handsome serval who seems to be enjoying his new life at Carolina Tiger Rescue. Daxon was rescued in June of 2017 from a private owner. He had been a pet for the first 3 years of his life, until his owner decided they could not give him the best life possible. 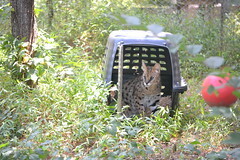 Carolina Tiger Rescue was contacted and we traveled to pick him up and bring him to his forever home. 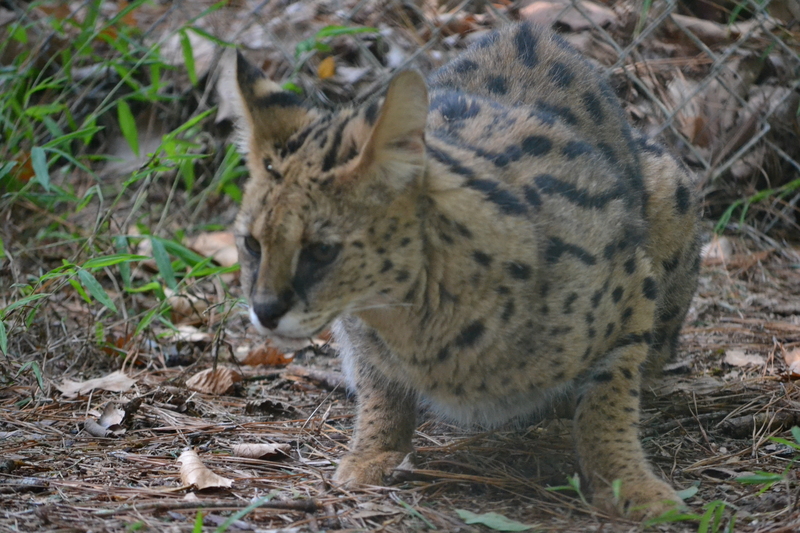 Daxon is a shy serval who takes a bit to warm up to new experiences. 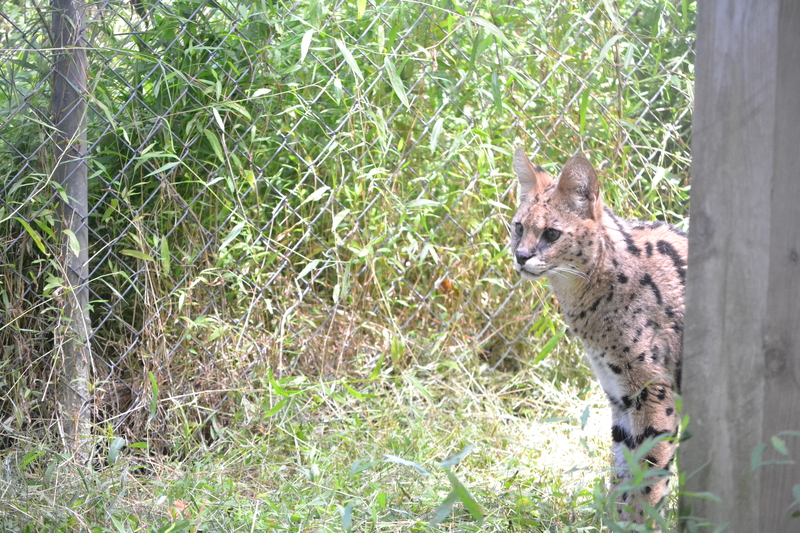 Now that he is out of quarantine and in his new home in his outdoor enclosure, Daxon is coming out of his shell. The day he was released he took no time at all to explore his new home! Daxon is a tall serval with darker fur than some of our other resident servals. His fur is almost brown instead of the typical yellow or tan. Daxon is located on Mimosa Point. 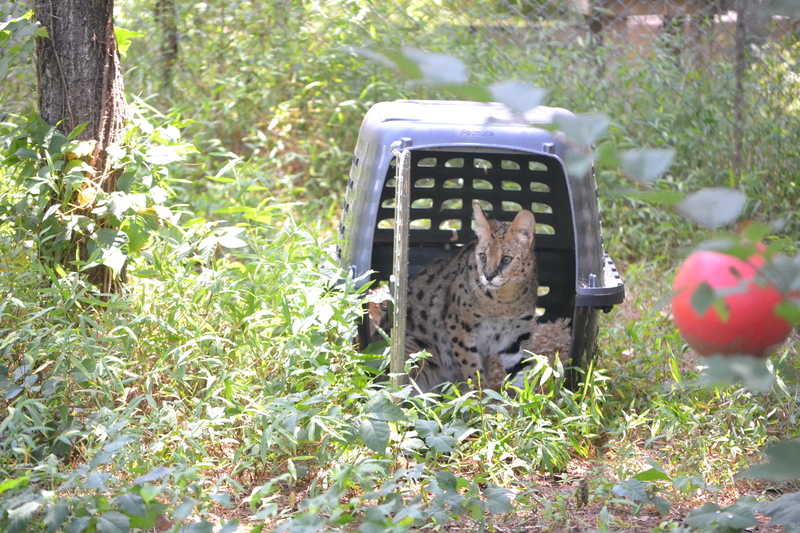 Daxon was a bit anxious and nervous when he first arrived and while he was in quarantine, so it was decided he would likely enjoy an enclosure away from the tour path. 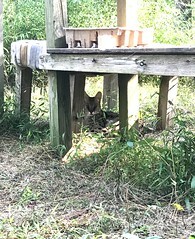 Unfortunately, several of our residents have first been privately owned pets. 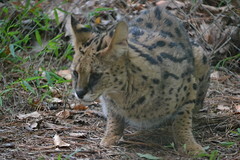 Many people, with good intentions, feel they can handle a wild cat in their home. They hope if they raise it from a baby that they can somehow love the wild out of the animal, but, in all cases, this is not true. Wild cats maintain their wild instincts. They are deadly predators and they are born with the instinct to survive. Oftentimes when the animal matures, they become extremely aggressive. 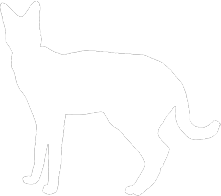 The owners find themselves having to make difficult decisions, whether it is to give up the animal or, unfortunately in some cases, the animal is put down, abandoned, or neglected because the owners are simply not equipped to handle a wild animal. 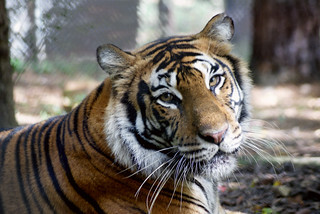 In Daxon's case, his owner realized they could not provide him with the best home, one in which he could be a wild cat, and decided to surrender him to Carolina Tiger Rescue. 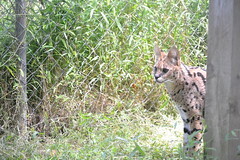 Carolina Tiger Rescue is against the private ownership of wild cats and other dangerous animals.